Hi from Designer Chris! 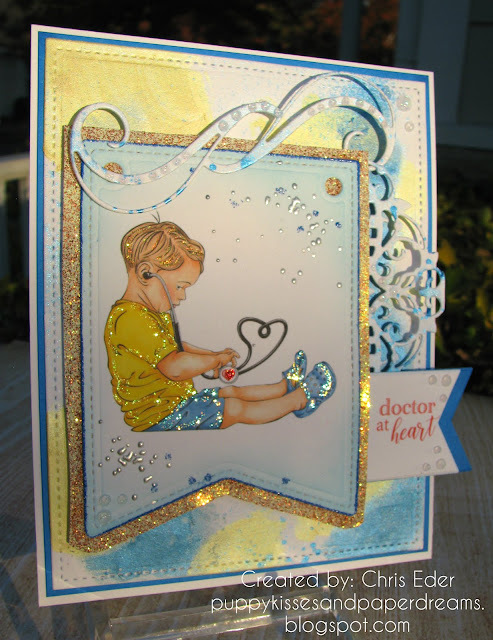 Today's card is so sweet, it is "Doctor at Heart" stamp set, one of our new releases for November. I used the digi version, and I chose the pre-colored image which freed up my time to bling it up instead of doing a lot of coloring first. Let's peek at this card! I sized the digital image on my computer, and then printed it with my color printer. I die cut the image with a banner die. 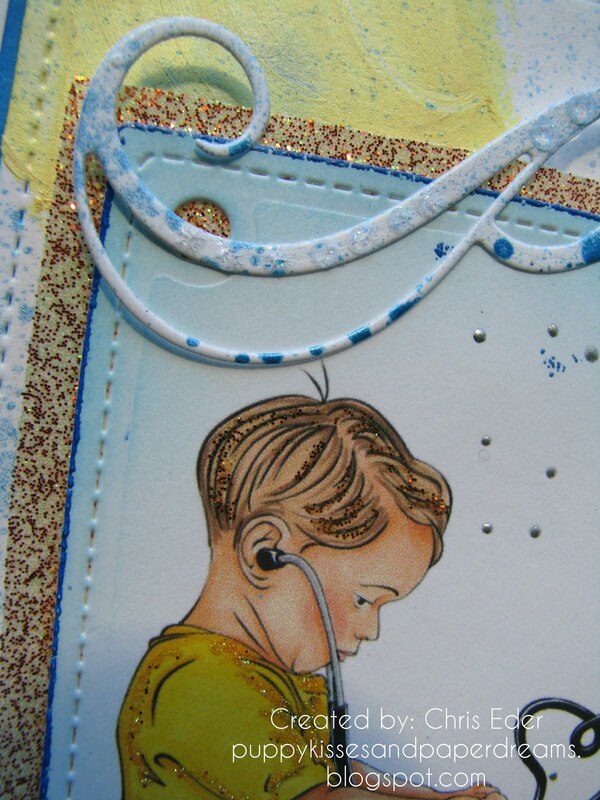 I also blended on some blue distress ink to the edges. 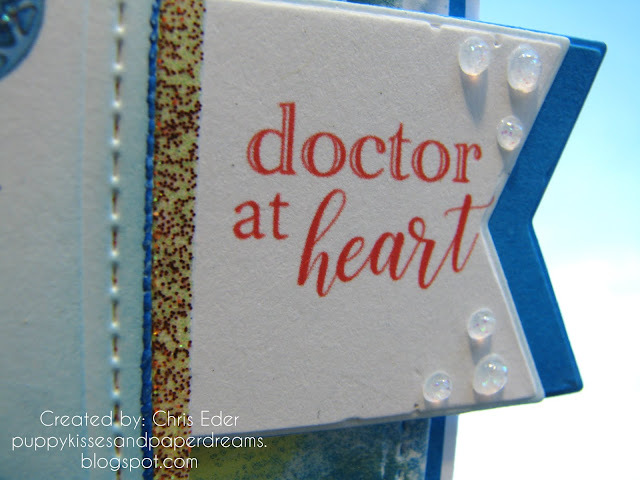 I then swiped the Nuvo Clear Mark embossing pen along the outer edge, sprinkled on Sapphire embossing powder and heat set it. I also used the Nuvo Smooth Precision Glue Pen to roll on some adhesive along the edges and folds of the boy's clothes. I sprinkled on Sunset glitter for his hair, Butterscotch glitter for his shirt, and Rapture Blue for his shorts. I also added a wee bit of red, using Gypsy Red glitter, to the heart on his stethoscope. I layered a piece of Sticker Paper behind the banner shape, trimmed it, and then sprinkled on Sunset glitter as a frame. I also die cut some cardstock using my Tonic Tangerine and the Tonic ARchway Stripe Invite Insert die set. I spritzed on some Nebula Blue mica mist to give it some dimension, and squeezed on some White Blizzard glitter drops. I printed out a sentiment, cut it into a fish tail shape, inked the edges, and cut another fish tail banner shape to frame it. I layered these two together, adhered them under the panel edge, and added more White Blizzard glitter drops. 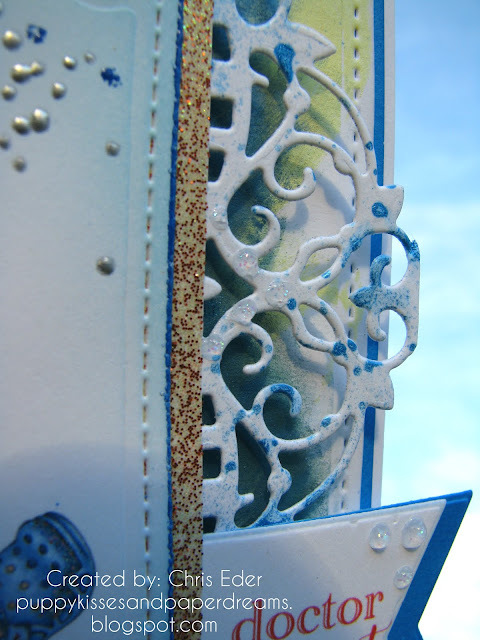 I colored a card base with Nuvo Custard Cream and Pacific Teal embellisment mousses. I just swirled some colors around until I had enough color to give it some depth and fun. 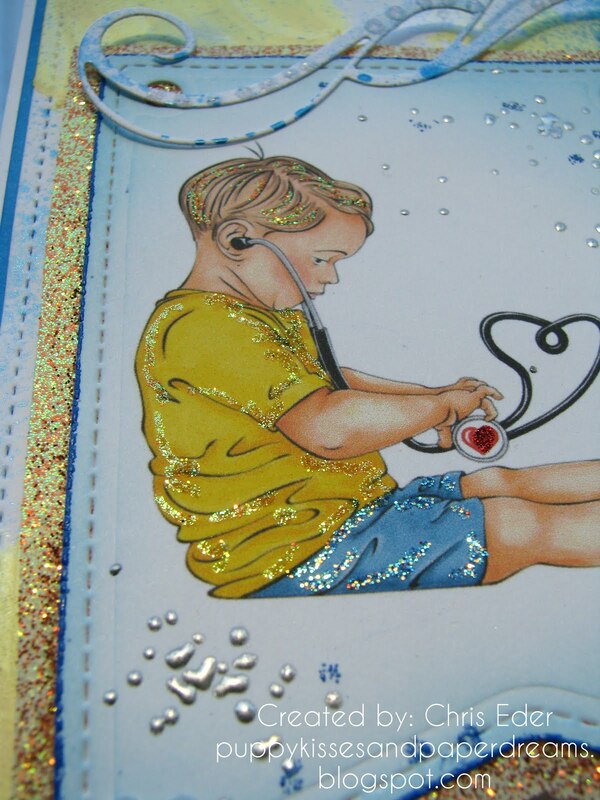 I then spritzed the card panel with Nebula Blue mica mist. I also sprinkled on some Super Thick Silver and Sapphire embossing powders and heat them set as well. I layered everything together, and this card was done! This was a really fun card to make. I really like using pre-colored digi stamps. Sparkle N Sprinkle includes both a pre-colored and non-colored image so you can do what makes you happy with these digi stamps. And they can be sized to whatever you want. So easy and fun!